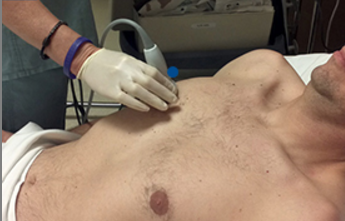 SONOSIM SUMMARY: This article outlines clinical applications of ultrasonography as an objective and direct measure of pulmonary edema in cases of acute heart failure. The study specifies that the summation of B-lines and/or quantification of positive or negative findings in lung zones may be helpful in gauging pulmonary edema severity and stratifying risk. The authors conclude that ultrasonography shows promising potential as an objective measure of pulmonary edema in cases of acute heart failure; however, more research is needed for a standardized approach to be developed. Objective noninvasive measures of dyspnea in patients with acute heart failure are lacking. In this review, we describe lung ultrasound as a tool to estimate the degree of pulmonary congestion in patients presenting with acute heart failure and to monitor therapeutic efficacy. Serial semiquantitative measures of sonographic B-lines in acute heart failure patients can be converted to pulmonary edema scores obtained at admission and hospital discharge. These scores provide prognostic information for short-term clinical outcomes. Lung ultrasound has the potential to measure changes in pulmonary edema during acute heart failure management and improve risk stratification.